Meryl Streep plays Julia Child in Julie & Julia, Nora Ephron’s sweet and spicy adaptation of the memoirs of two women whose obsession with food changed their lives. Streep’s Julia is a perfectly divine souffle. The other half of the title’s duo is Julie Powell, the New York writer who decided to prepare all of Julia’s 524 recipes in 365 days, while blogging her triumphs and frustrations on a daily basis. The blog became a best selling book. In the movie, Amy Adams plays Powell. Streep and Adams previously shared the screen in Doubt, but in Julie & Julia, they’re in parallel universes. As Julia, Streep faces the singular challenge of re-creating the quirky and beloved icon who’s so widely and vividly impersonated that it’s hard to recall just what the real Julia was really like. How did Streep approach becoming Julia? 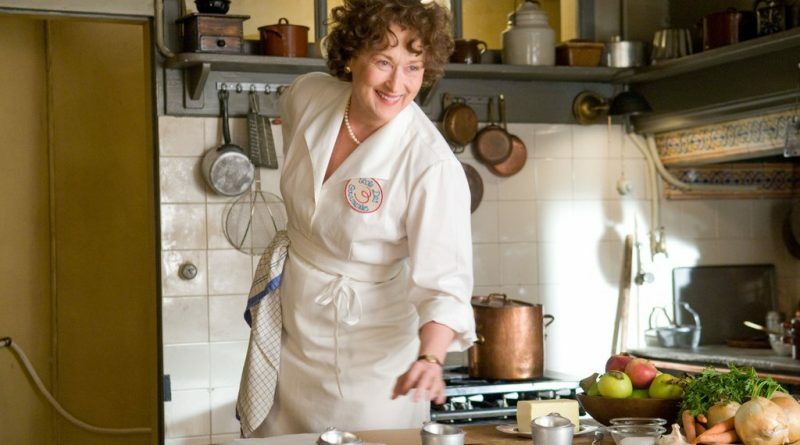 MERYL STREEP: Well, humm, I bet everybody in the world can do their own version of Julia Child. That voice was so familiar. And then there was Dan Ackroyd‘s famous impersonation. And, how do we know whether we‘re doing Julia, or Dan’s version of her. Everybody can sort of pull that (she slips into her Julia voice) ‘bon appetite’ out of themselves. What made you decide to take the role? STREEP: When Nora Ephron told me she was doing the script, I thought that would be great. And the script was beautifully written. And, I thought this was a good opportunity to do a couple of things — not only to impersonate Julia Child, or really to create Julie Powell’s idea of her, because I‘m doing an idealized version of Julia. But I’m also doing an idealized version of my mother, who had a similar joie de vivre, an undeniable sense of how to enjoy her life. Every room she walked in to, she made brighter. My mother was really something. I have a good deal of my father in me, which is another kind of sensibility, But, really, all of my life I’ve wanted to be more like my mother. So this is my homage to her spirit. That’s actually what I was doing, more than just a version of Julia Child. Julia Child’s life — at least the part covered in the movie — is so much about food. Was your mother fascinated with food, too. Did you have special memories about your mother and food? STREEP: My mother was of the I Hate To Cook cookbook school of cooks. My mother’s food philosophy was if it’s not done in 20 minutes, it’s not dinner. She had a lot of things she liked to do, and cooking was not one of them. Yeah, my food memories were — well, I‘d have to say that I really do think Julia Child did change our whole perception about food. I remember when I was ten years old, going to the little girl‘s house up the street, and she and her mother were sitting at the kitchen table doing something to big white tennis balls, and I asked what they were doing, and she told me they were making mashed potatoes, and I said, “What do you mean? Mashed potatoes come in a box!” They were peeling boiled potatoes, and I had never seen a potato before. I recently found my knitting book at the bottom of my knitting bag from the 1960s — well, it wasn’t a knitting book. It was a magazine called Woman‘s Day from 1967, and it had knitting patterns in it and it’s filled with recipes and food ads, and it’s all Del Monte canned peas, Del Monte canned corn, Del Monte canned peas and corn, Del Monte canned greenbeens. And, all the recipes are to take ground meat and mix it with artificial mashed potatoes, layer it, top it off with tomato sauce out of a jar, put it in the oven — presto: dinner. This is how we ate. People forget. Really. The organic movement, the Alice Waters thing have by now all come into it, but Julia changed the way people thought about cooking and what she did was great. If you could meet Julia Child in person, what would you like to ask her? And what would you like to ask Paul, her husband, who was so supportive and loving? STREEP: I think I’d love most to have heard Paul’s voice. Julia’s is so vivid and she left behind such an articulate trail of her journey in her memoir and her cookbook. Her voice really comes through. But I would love to have heard Paul. I’m sure he was a really interesting person to hear, so full of stories about his life and experiences. And there are so many mysteries about Julia and Paul’s story, now that we know they worked for the OSS. How did Julia manage to write this 700 page cookbook in between collecting secrets…or whatever she was doing? Julia and Paul’s relationship is fabulous. Paul seems to be the ideal husband. It’s unusual, perhaps, to find men — on screen and in real life — who are so dedicated to sustaining their wives’ goals. Have you found that to be rare? STREEP: You know, it’s hard to say. With regard to my life? I don’t really think about sustaining my career. Like every other actor, I’ve been unemployed more than I’ve been working. Because of the nature of what we do, it seems we have a lot of down time, even though it seems you’re working, working, working. So it’s a very uncertain life. I’ve never gotten used to either working or being out of work. And there are only a very few people who would sign up to be married to someone doing that kind of career. My husband is an artist, so he understands the vagaries of my job. I just take it as if every day is a miracle, and I’m really glad that I’m working and that people are not sick of me…because (she laughs) I’m sick of me! Well, then, I guess you’re really lucky to play such interesting women and explore their worlds. Of all the characters you‘ve played, is there one you‘d like to hang out with for a while? Yes, I’d choose Isak Dinesen. She was a really interesting person, and I’d like to spend some time with her. Getting back to Paul, Stanley Tucci is lovely portraying him in the film. As actors, you two have extraordinary chemistry. Did you know each other before? What was the recipe for creating this particular onscreen relationship? STREEP: Well, it so happens that Stanley and I are often on opposite sides in a very famous charades game at Christmas, so we’ve been at each other’s throats for many years, and we know each other that way. And I’ve been sort of in love with him from afar, actually with the totality of the man — from Big Night to all of his acting and directing work. It was a real treat to get to work with him, and it wasn’t a tough job to imagine being in love with him. Then the relationship really fell into place when Nora (Ephron, the director) did a costume test that was actually her way of introducing us to our world. She took us to the rooms they’d built to be our Paris apartment — which was actually built in Queens (New York) — and she let us walk around in our costumes, and it sort of absorb it all. Well, when you’re in isolation in your Winnebago, or whatever trailer it is, you sort of have a hard time preparing. But when you walk into this world, and the light comes into the room in a certain way and there’s a skyscape of Paris — which is, of course, a photograph…but still — and you see the man of your dreams. It sort of came together that way before we began shooting. Stanley Tucci is a foodie in real life, too. Did you and he have any special experiences bonding over food? STREEP:Well, there was the time he came to dinner. As I said, I knew Stanley, so I thought I might as well invite him over for dinner. So he came. I decided I’d make blanquette de veau, and it was not quite done when he arrived. So he came in — and completely took over in the kitchen: (She lowers her voice) Why are you doing it that way? Not to be critical, but just asking. Why do you hold it that way? It’s okay but I can show you an easier way to do it. Stanley’s a great chef, and I’m a cook. In the film, Julia finds herself through cooking — at age 49 — and through writing her cookbook. She overcame enormous challenges — skepticism at cooking school, publisher rejections, and all that. When you were starting out your career, what were the biggest challenges you faced? STREEP: Starting out? My biggest challenge was making a commitment to acting, and convincing myself to think it was a serious enough thing to do with my life. You know, the question was what are your going to do with your one wild life? And, I just didn’t think acting was…I don’t know…I thought it was silly and vain, acting. Even though it was the most fun thing that I’d ever done and it remains being that. But you know, ergo, it can’t be good for me, or that was my underlying thought. And, so, my biggest challenge was just deciding to do it. I remember when anyone asked me (she uses a deep, imperious voice) “Well, what do you do?,” I’d always say (and she sort of swallows her words in an uncharacteristic mumble), “Well, I’m an actor.” I didn’t want to admit it. It took me a long time before I would admit it. Seriously. You found it difficult to take acting seriously, yet you’ve commented forcefully through your acting about qualities of humanity and qualities of life. What things were you considering back then as alternatives to acting? STREEP: Well, when I was in school, I was obsessed with the book Jonathan Livingston Seagull, and I’ve always been interested in environmental issues and I still am, and that seems to me to be very worthwhile work. But over time I’ve understood — from what I take from seeing other actors’ work — that I need, we need art as much as we need good works. You need food and you need inspiration to keep going on the days that you’re low. We need each other in that way, and so, yeah, I’ve reconciled myself to the fact that you can make contribution as an actor, and I’ve even reconciled myself to the fact that my children can choose this profession. At one point that didn’t seem to be okay, but now it’s fine. Really I was pushing the sciences, but I’ve stopped that. Yes, audiences learn much of what they know of the world from movies. Although Julie and Julia is a truth-based romantic comedy, there are certainly challenging political questions — not only about women getting ahead in their careers, but also about how McCarthyism impacted Julia and Paul when Paul, a U.S. diplomat, was called in for questioning about his politics. Is that aspect of the script important to you? STREEP: It’s hard for us to imagine now the kind of terror a lot of people lived under back then, when your entire livelihood could be taken away. A mention on the blacklist, and it was gone. People’s lives were ruined within a year. Within one year of being blacklisted. That blacklist was a done deal. It was over. It was over. Karel Reisz’’s wife (Julia Coppard) moved to England and never worked again in this county. So many people. I don’t think we have any sense of it now — how an association (with a political party) could — in this free country — it could prevent you from making a living forever. That happened, though. So it’s an important reminder of that. With The Devil Wears Prada, Mamma Mia! and, now, Julie & Julia, your range of roles just keeps expanding. Do you have all the choices you’d like? STREEP: I seem to have more in the last five years than in the previous five years, and I really don’t know why that is. But part of it has to do, I think, with the fact that there are more women executives making decisions. Because it all has to do with budgets and where the money comes from, and so I’m sure they have had more to do with making choices available to me that than I have. You’ve been working with women directors — Phyllida Lloyd on Mamma, Nora on this, and Nancy Meyers’ new and as yet untitled film coming up. Does that make a difference? STREEP: There isn’t really a category of women directors. Every director is different, really, really different. Nora’s different from Phyllida and Nancy is very different from each of them. It’s just that sometimes directorial opportunities for women haven’t been there — and they should be and I hope we see that more and more. Your name attached to a project is, I imagine, the key to getting it produced. Do you have a dream project you’d like to work on? STREEP: No. Do you have an idea for me? (PLEASE NOTE: THIS MATERIAL IS PROTECTED BY COPYRIGHT, AND MAY NOT BE REPRODUCED WITHOUT EXPRESSED AND WRITTEN PERMISSION OF THE ALLIANCE OF WOMEN FILM JOURNALISTS).